Have you ever wanted to know the weight of something? How about knowing the change in weight over time? 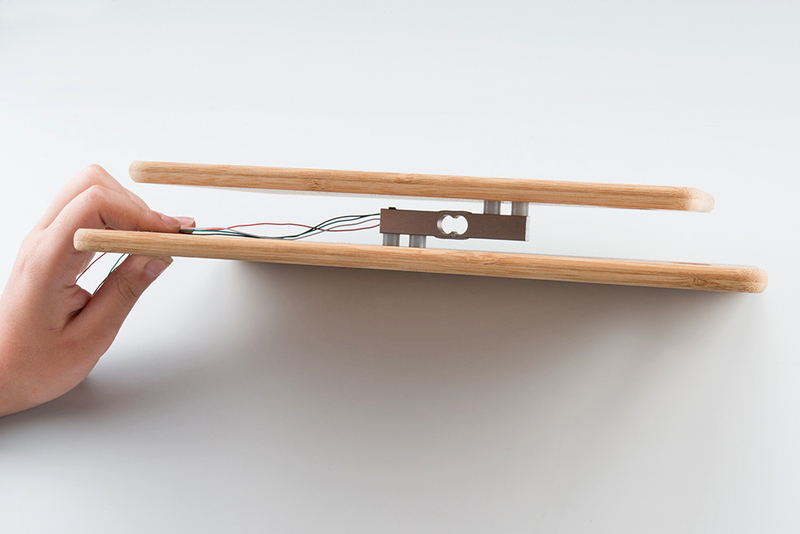 Do you want your project to sense the presence of something by measuring strain or a load on some surface? If so, you're in the right place. 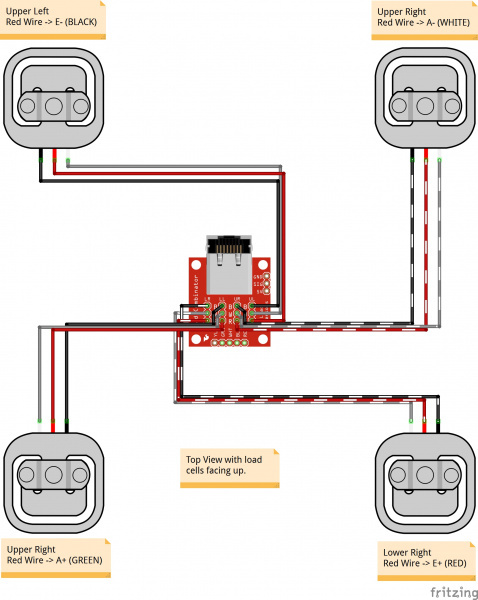 This tutorial is here to help you get started in the world of load cells and their variants. One of many kinds of load cells. A load cell is a physical element (or transducer if you want to be technical) that can translate pressure (force) into an electrical signal. So what does that mean? There are three main ways a load cell can translate an applied force into a measurable reading. 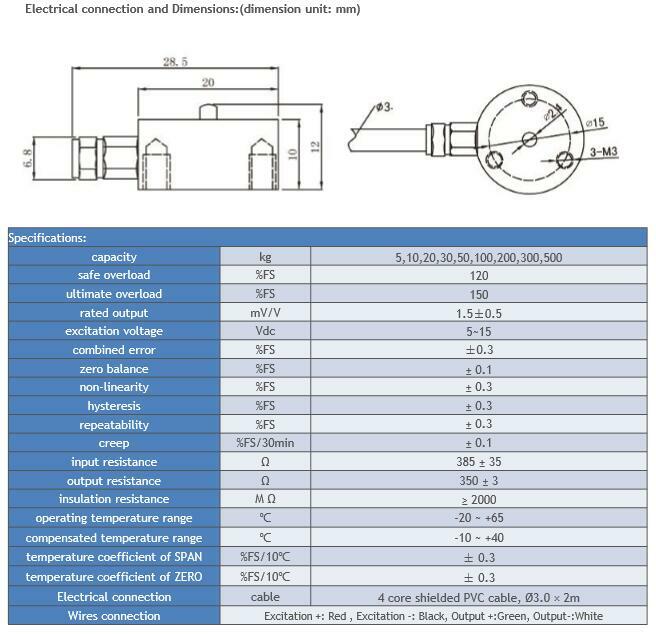 Hydraulic load cells use a conventional piston and cylinder arrangement to convey a change in pressure by the movement of the piston and a diaphragm arrangement which produces a change in the pressure on a Bourdon tube connected with the load cells. 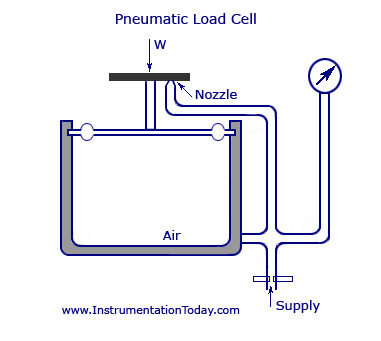 Pneumatic load cells use air pressure applied to one end of a diaphragm, and it escapes through the nozzle placed at the bottom of the load cell, which has a pressure gauge inside of the cell. And lastly (though there are many other less common load cell set ups), there is a strain gauge load cell, which is a mechanical element of which the force is being sensed by the deformation of a (or several) strain gauge(s) on the element. 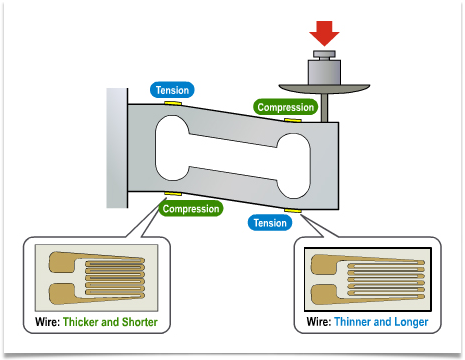 In bar strain gauge load cells, the cell is set up in a "Z" formations so that torque is applied to the bar and the four strain gauges on the cell will measure the bending distortion, two measuring compression and two tension. 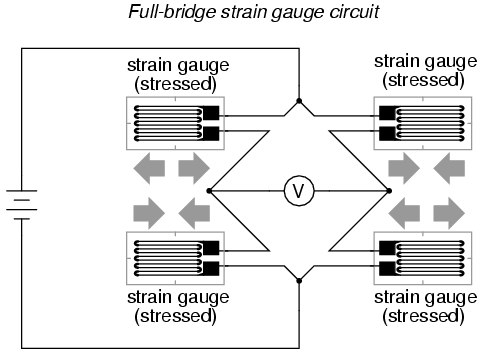 When these four strain gauges are set up in a wheatstone bridge formation, it is easy to accurately measure the small changes in resistance from the strain gauges. Most strain gauge load cells work in very similar ways, but may vary in size, material, and mechanical setup, which can lead to each cell having different max loads and sensitivities that they can handle. 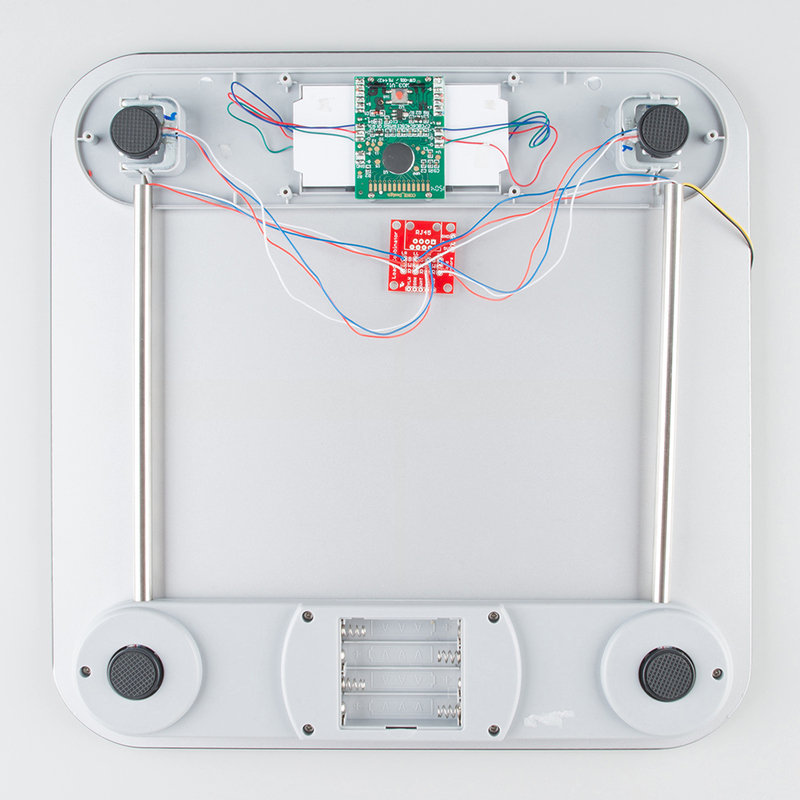 For a few possible load cell mechanical setups, check out the hookup guide with the load cell setup. A strain gauge is a device that measures electrical resistance changes in response to, and proportional of, strain (or pressure or force or whatever you so desire to call it) applied to the device. The most common strain gauge is made up of very fine wire, or foil, set up in a grid pattern in such a way that there is a linear change in electrical resistance when strain is applied in one specific direction, most commonly found with a base resistance of 120Ω, 350Ω, and 1,000Ω. We set up a strain gauge load cell and measure that change in resistance and all is good, right? Not so fast. Strain measurements rarely involve quantities larger than a few millistrain (fancy units for strain, but still very small). For a 120Ω gauge, this is a change of only 0.12Ω. 0.12Ω is a very small change, and, for most devices, couldn't actually be detected, let alone detected accurately. So we are going to need another device that can either accurately measure super small changes in resistance (spoiler: they are very expensive) or a device that can take that very small change in resistance and turn it into something that we can measure accurately. This is where an amplifier, such as the HX711 or the NAU7802 comes in handy. By replacing one of the resistors in a wheatstone bridge with a strain gauge, we can easily measure the change in Vout and use that to assess the force applied. But what happens when you don't have a load cell with four strain gauges? Or you want to measure something really heavy on something scale like? 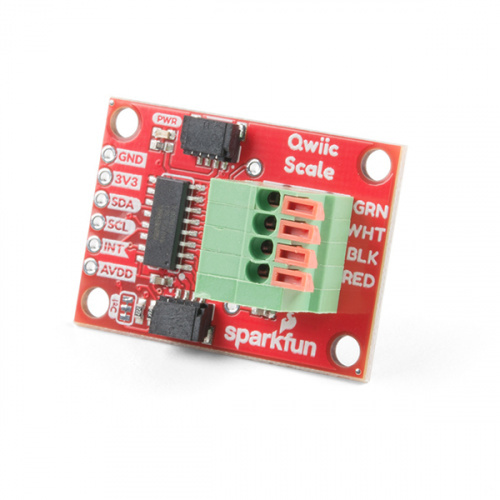 You can combine four single strain gauge load cells (sometimes referred to as Load sensors) using the load sensor combinator breakout board! Using the same wheatstone bridge principle, you can use the combinator to combine the single strain gauge load cells into a wheatstone bridge configuration where the force applied to all four single strain gauge load cells is added to give you a higher maximum load, and better accuracy than just one. The combinator can be hooked up to the same amplifier for easier measuring. This is the same layout that you would find in say your home scale. There would be four single strain gauge load cells hooked up to a combinator and an amplifier to give you your weight reading. For more information about setting up the four single strain gauges with the combinator, check out the combinator&apos;s hardware hookup for the HX711. This setup can also be used with the NAU7802. You may also be interested in learning about the OpenScale or connecting a load cell to the cloud with the following tutorials! OpenScale allows you to have a permanent scale for industrial and biological applications. Learn how to use the OpenScale board to read and configure load cells. Need even more? 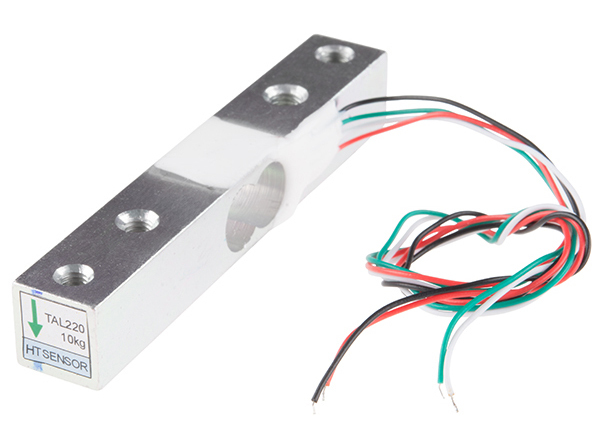 Check out this awesome article wheatstone bridges and load cell types. 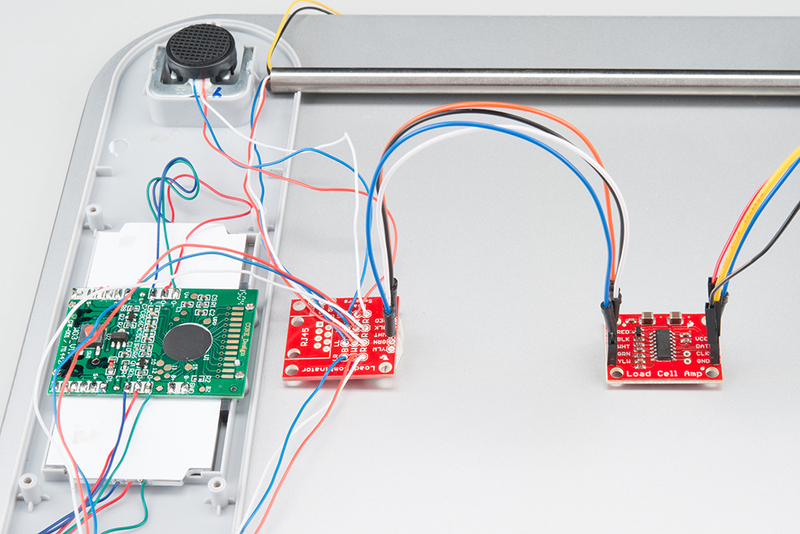 Can't get enough about how load cells work? Check out this article for more in depth information.